DICE: Battlefield is becoming a "first-person shooter/vehicular combat platform". Like it or not, the annual release of a new Call of Duty game hits the gaming market like a kid doing a cannonball. Publishers desperately move their release dates to get out of the way, and the mainstream media makes it a line item on the nightly news. While it might make a huge splash, that's not a game that DICE wants to play with its Battlefield franchise. 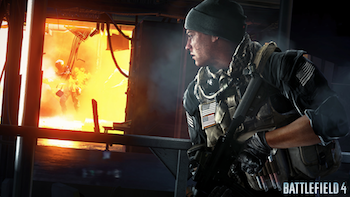 "We can't build a game at DICE every year," Battlefield 4 executive producer Patrick Bach told Videogamer. It's not for lack of demand, he says, but lack of reason. "Now it's been almost two years and people feel like they are continuously playing - we still have huge amounts of players playing Battlefield 3... Battlefield is almost turning into a first-person shooter/vehicular combat platform where people want more things but put into the same core mechanic." Even so, he's quick to point out that the upcoming Battlefield 4 has reasons to exist. "Doing things like we're doing after Battlefield 4, you couldn't do that within [Battlefield 3]. It's not the same game... Just the fact that the customization layer is so much deeper, is based on a complete rewrite of the core handling of assets from the ground-up." Meanwhile, Battlefield 4 will arrive on PC, Xbox 360, and Playstation 3 November 1st, with Xbox One and Playstation 4 versions expected later.